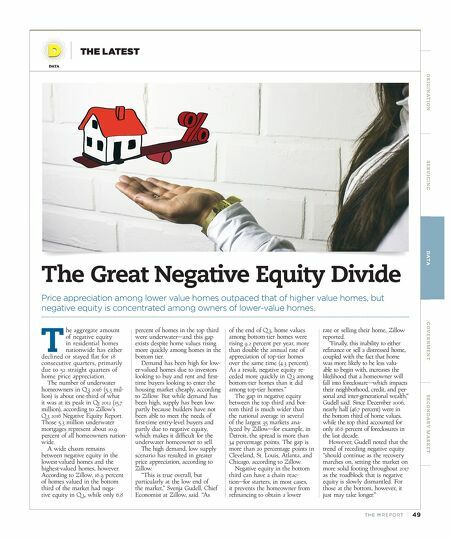 TH E M R EP O RT | 49 O R I G I NAT I O N S E R V I C I N G DATA G O V E R N M E N T S E C O N DA R Y M A R K E T DATA THE LATEST The Great Negative Equity Divide Price appreciation among lower value homes outpaced that of higher value homes, but negative equity is concentrated among owners of lower-value homes. T he aggregate amount of negative equity in residential homes nationwide has either declined or stayed flat for 18 consecutive quarters, primarily due to 52 straight quarters of home price appreciation. The number of underwater homeowners in Q 3 2016 (5.3 mil - lion) is about one-third of what it was at its peak in Q1 2012 (15.7 million), according to Zillow's Q 3 2016 Negative Equity Report. Those 5.3 million underwater mortgages represent about 10.9 percent of all homeowners nation - wide. A wide chasm remains between negative equity in the lowest-valued homes and the highest-valued homes, however. According to Zillow, 16.9 percent of homes valued in the bottom third of the market had nega - tive equity in Q 3, while only 6.8 percent of homes in the top third were underwater—and this gap exists despite home values rising more quickly among homes in the bottom tier. Demand has been high for low - er-valued homes due to investors looking to buy and rent and first- time buyers looking to enter the housing market cheaply, according to Zillow. 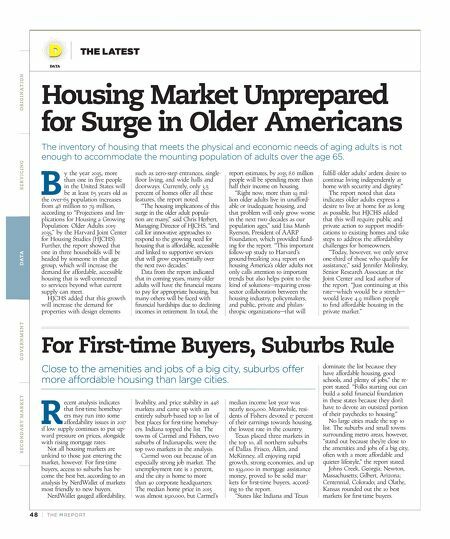 But while demand has been high, supply has been low partly because builders have not been able to meet the needs of first-time entry-level buyers and partly due to negative equity, which makes it difficult for the underwater homeowner to sell. The high demand, low supply scenario has resulted in greater price appreciation, according to Zillow. "This is true overall, but particularly at the low end of the market," Svenja Gudell, Chief Economist at Zillow, said. "As of the end of Q 3, home values among bottom-tier homes were rising 9.2 percent per year, more than double the annual rate of appreciation of top-tier homes over the same time (4.3 percent). As a result, negative equity re - ceded more quickly in Q 3 among bottom-tier homes than it did among top-tier homes." The gap in negative equity between the top third and bot - tom third is much wider than the national average in several of the largest 35 markets ana- lyzed by Zillow—for example, in Detroit, the spread is more than 34 percentage points. The gap is more than 20 percentage points in Cleveland, St. Louis, Atlanta, and Chicago, according to Zillow. Negative equity in the bottom third can have a chain reac - tion—for starters, in most cases, it prevents the homeowner from refinancing to obtain a lower rate or selling their home, Zillow reported. "Finally, this inability to either refinance or sell a distressed home, coupled with the fact that home was more likely to be less valu - able to begin with, increases the likelihood that a homeowner will fall into foreclosure—which impacts their neighborhood, credit, and per - sonal and inter-generational wealth," Gudell said. Since December 2006, nearly half (46.7 percent) were in the bottom third of home values, while the top third accounted for only 16.6 percent of foreclosures in the last decade. However, Gudell noted that the trend of receding negative equity "should continue as the recovery marches on, setting the market on more solid footing throughout 2017 as the roadblock that is negative equity is slowly dismantled. For those at the bottom, however, it just may take longer."